Hello fellow runners! I’m Shayla, a wife, mom, physician, and now a runner. I started running in late summer/early fall of 2010. I’ve always enjoyed exercising and being active but I never liked running. I always felt like I couldn’t breathe, my legs would hurt, my feet would hurt, it was too hot, etc. when it came to running. However, after having a son, I felt like I needed to lose weight and become more active in activities that I could one day share with him. After reading numerous blog posts, Facebook posts, and forums, I started on the Couch to 5K Program (http://www.coolrunning.com/engine/2/2_3/181.shtml). This is a 9 week run/walk interval program designed to get a non-runner up to running a 5K. I completed the program in about 12 weeks (repeating some weeks due to missing workouts), and ran my first 5K in December of 2010 at the Jingle Jog 5K race in Northern Kentucky. It was snowing that morning and many family members, including my husband, thought I was crazy for wanting to run over 3 miles in the snow. But, I finished, and after that, I was hooked! 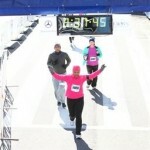 I continued to train throughout the winter and ran another 5K in March of 2011. After the second 5K, I felt like it was time to increase my mileage, so I signed up for my first 10K as part of The Flying Pig races here in Cincinnati in May of 2011. My husband ran this race with me, it was fun to have him out there too! Following this race, I knew I had to keep pushing to meet one of my ultimate life goals, running a marathon. Why, because at this point, I knew I had to for some inner sense of fulfillment in this new running life, but I wasn’t quite sure that I could just yet. I signed up for the Air Force Half Marathon in Dayton, Ohio. I trained throughout the summer and quickly learned that it would take a new level of endurance to run in the summer heat versus the cool winter temperatures I had started to enjoy. I purchased a Camelbak for hydrating during my long runs and started to run early in the morning (6ish) to beat the heat. 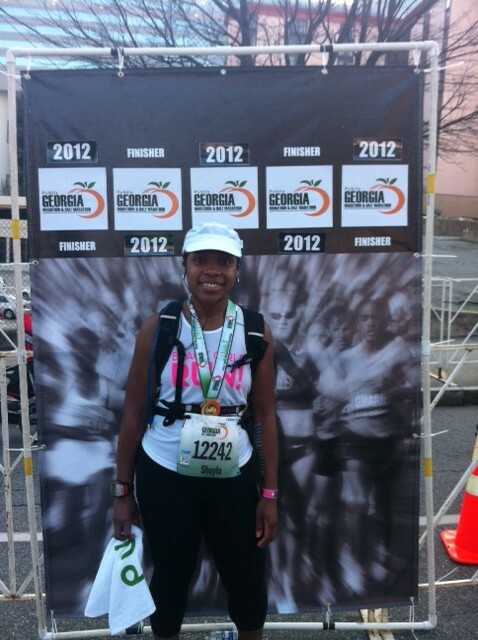 Finally, September 2011 had arrived and it was time for me to run my first half marathon. It was a beautiful day at Wright Patterson Air Force Base. The course was great, relatively flat with just a few hills tossed in, and I met some very friendly fellow runners. The finish line was on the runway and we ran through planes that had been aligned on each side of the runway. I was tired, but me, this non-runner, had just completed 13.1 miles, and I felt like a champion running through those planes. 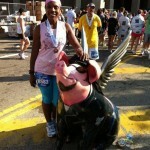 I knew at the end of this race, I would need to revisit The Flying Pig, as a half marathoner, and did early registration for the 2012 race. At the the end of the year, I went on to complete another 5K and 10K but still held in the back of my mind the fact that I wanted to run a marathon. I enjoy participating in organized races because it helps me to focus on goals of my training. So, I signed up for half marathons for 2012. I have run a half marathon in February, March, and April of this year. After the February race, I decided that 2012 would be my year. 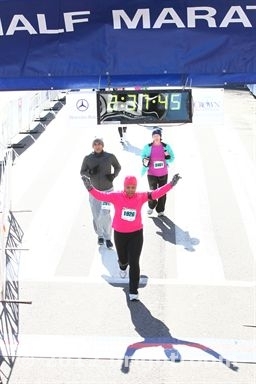 I registered for my first full marathon, the Rite Aid Cleveland Marathon, to be held on May 20, 2012. My training plan wasn’t vastly different from what I had been using for training for half marathons, but it included increased distances over the weekends and the half marathons scheduled were a perfect fit for training. I recently had the opportunity to revisit The Flying Pig. 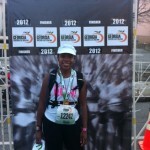 This time I ran the half marathon. It was awesome! The crowd support and volunteer support for this race was superb! Although it was a very hilly course, I surprised myself and scored a new personal record. Talk about a “runners high!” This was the perfect taper race to let me know that I was prepared for the challenge of the full marathon I have ahead in just two weeks. Training for the full marathon has been more of a test of dedication than anything! Many days I have to start running at 5am to get my mileage in and still perform my wife, mom, and doctor duties. Learning to refuel and hydrate has also been quite the test, trying to balance proper fueling/hydration without overdoing it and becoming queasy. Why do I run now? Because I enjoy it, it helps me think, brings clarity to my day, it helps me stay fit and ward off preventable/obesity related diseases, and because I realize now, I can. I am very much looking forward to my first marathon in May! I have a goal time in mind, but my ultimate goal is to FINISH. It’ll be amazing to see this non-runner become a marathoner! 1. Get advice from the experts. Some online resources I like are Runnersworld, Jeff Galloway, and Hal Higdon. 2. It can be motivating to run with a group. 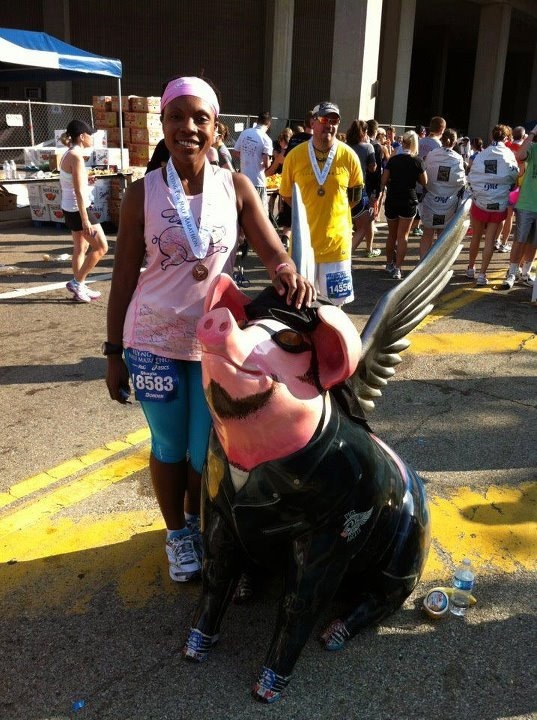 I regularly run with Black Girls Run-Cincinnati. There are multiple running groups around the country. Many cities have a local running group and welcome newbies even if you’re just in town visiting. It’s also a perfect way to see a new city and stay in shape while traveling. 3. Running expos before large races are neat places to test out and purchase new gear. 4. Get fitted for running shoes that are customized to your feet and your gait. Support your local running stores! 5. Find a race in your area, sign up for it, and train. Its always fun to have a “deadline” to reach a new running goal!